The Audio-Technica AT2020 microphone has been by far my most favorite affordable budget-friendly microphone I have ever owned. It has a very sturdy quality build with great premium parts inside. The quality of the sound has a good mid-range sound as far as highs and lows go. I would say this microphone tends to be more on the higher treble side than the lower base side but nonetheless this can all be adjusted in your equalizer. If you were looking for a great starter microphone for your home studio recording I would highly recommend this as a great starting point. Audio-Technica has been around for a while and they do have some respect to their brand from many other musicians and composers. This microphone is more for recording instead of video and conference calling through the computer although it will easily be able to accomplish this as well with a breeze. If I have one gripe about this microphone it would be the cardioid shape for the sound. Your cardioid is the direction that the microphone will allow sound in. Without being completely around the microphone this means only one side of the microphone picks up sound and you must be facing that side. Unlike more high-dollar expensive microphones that pick up all around, on this microphone you will have to keep in mind which side is the front. I know many microphones do have front and back but in my preferences I do not like that I have to think about the fact if I am speaking into the front or the back I like to be able to grab the microphone and just start singing. At the price point of $100 I think this microphone is easily within most people's budget and this is why I highly suggest this is one as this is one of the best microphones for people starting out on a budget that I have ever used. In fact you may not even need to upgrade microphones for some time, the quality is just that good. Sometimes you can find this mic in a bundle with other accessories but the mic alone has held its price point at or around $100 dollars for years now. 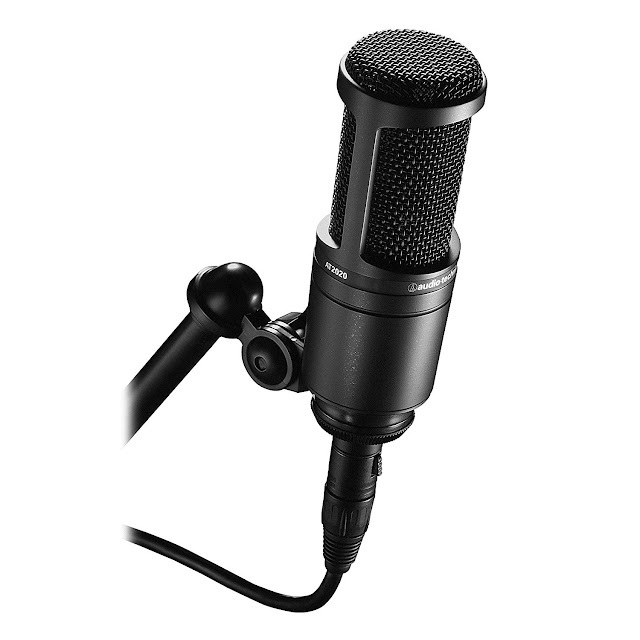 Every once in a while I have seen the mic on sale for about $70 bucks but it is not too common. This is your traditional XLR condenser mic and not one of those USB baby mics. Don't get me wrong some of the USB mics have a nice sound but when it comes to routing your audio channels with your computer you are going to want to have a condenser mic running through phantom power, you just can't beat that traditional setup. If you have a budget of about $100 dollars to spend on a microphone then I would highly suggest the Audio Technica AT2020 as the mic to get. Soon as you hear the powerful rich warm sounds this thing can make you will know your money was well spent. Jake Rhodes is an internet entrepreneur who manages multiple streams of income by doing what he loves and monetizes from it such as writing, blogging, designing, advertising, and selling on Amazon along with other marketplaces.